In a recent Gallup/USA Today poll, 80% of Americans think that America “has a unique character that makes it the greatest country in the world.” However, more than one third say President Obama does not share that belief of “American exceptionalism”. 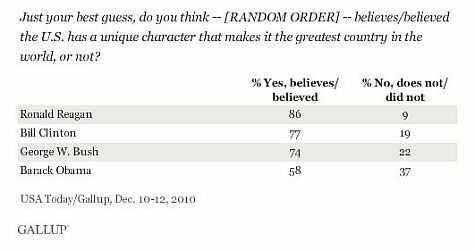 Only 58% believed that Obama shared the “exceptionalism” belief as compared to past Presidents like Reagan, Clinton and GWB at 86%, 77% and 74%, respectively. Americans who identify as Republicans, likely reflecting the opinions of some of their party’s leaders, are especially dubious that Obama regards the U.S. as exceptional. Thirty-four percent of Republicans believe the president thinks the United States is the greatest country in the world, while 61% believe he does not. Democrats are much more confident that Obama regards the United States as exceptional, while the majority of independents agree. CNN reminds us of Obama’s comments at a NATO summit where President Barack Obama hardly wowed Americans with his lack of understanding of “American exceptionalism”. Do not think that the public’s lack of confidence in Obama believing in American exceptionalism is not going to bite him in 2012. Those comments have sparked debate, with some of the Republicans who may make a bid for the next GOP presidential nomination highlighting that U.S. is exceptional but that its status is currently being threatened. Imo, Obama does not think that America is the greatest country ever. Neither does Michelle. 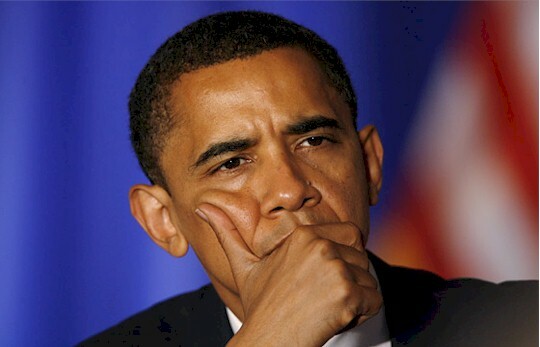 I think that many black people have had hardships growing up but I don’t believe that is the case with Obama. There are many things that we have all learned as children: standing when the national anthem is played – hand on your heart when pledging allegiance to the flag – knowing exactly how many states make up the United States. It often seems as though this president has never learned these things and maybe that’s because his elementary education was in another country. But why doesn’t he know these things now? He doesn’t think the USA is great and he doesn’t even have respect for this still great country. most illegals have no respect, they just want the free ride. same with obama. Is it because the age of US exceptionalism has passed? SM: Hardly Dolf, you wish. We have an illegal alien as President….I hope the Republicans can do something about it…!! !